You can see yourself coaching. Connecting with your clients on an intimate level on the phone, skype or zoom. 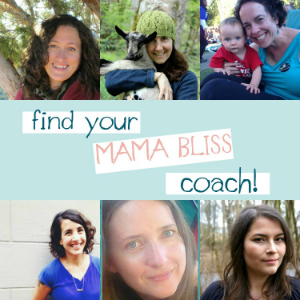 Or maybe even in person as you become a sounding board, asking questions to kickstart their inner knowingness, holding gentle accountability for them as they take babysteps toward their ideal days and manifesting their goals. 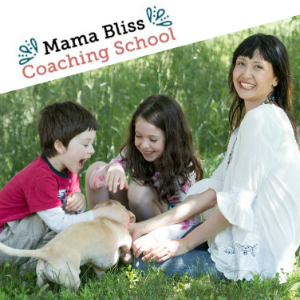 Or maybe more than seeing yourself coaching, you’re on the cusp of taking action to go down the coaching path by signing up for a coaching training program even. Well, you’re in luck. I have a free download today that will tell you step by step what to say and where. But first. A reality check. I often share here what really makes up a coach’s day. Mama or not. And the truth is, half of your time spent on your coaching biz will be spent on marketing. And those sets of tasks are going to bring you the clients. There are a lot of different marketing avenues to choose from so chances are likely you’ll find a set of tactics that you’ll actually find fun. Or you better find most of the ones you do fun because it’s something you have to do consistently to bring home a consistent income from this life path. You know that nursery rhyme This Little Piggy? That one I never grew tired saying to my kids. I would tug their sweet little chubby toes that looked like they were crazy-glued on by Sweet Baby Jesus Himself as an afterthought as I went though all of the little piggy activities; going to market, staying home, eating roast beef, not getting any roast beef and (after a deep breath and a giant, dramatic pause) crying all the way home. The going to market bit I always imagined as this pig going to the farmer’s market and having the most idyllic day buying fresh peonies and homemade sauerkraut. Then someone recently suggested to me that – jeez – maybe they meant, the piggy, like – ‘went’ to market. Now doesn’t that put a grim twist on this curly pig tale? So you get to choose when it comes to your perspective in what it is to spread the word about the awesomeness that is your coaching services so you can get coaching clients. Your marketing can be a sunshine, live folk music, flower filled farmer’s market dream montage or… a grim, medieval Red Wedding scene. Not to be dramatic but I see my marketing efforts as me pulling out my market tent from days of yore and just having fun with my peeps. So pay attention what fills your bliss bucket up when it comes to sharing good news and spreading the word about this beautiful medicine you have to offer (or plan on offering in the future). Because we don’t want to be hoarding the news. Coaching mama has to bring home the bacon! You need to showcase your expertise, your method, life philosophy, helpfulness and just simply remind your peeps you are a unique force to be reckoned with when it comes to rescuing them and that you are showing up! So this looks like regularly blog posting, or podcasting, youtubing, instagramming, newsletter sending… whichever modalities feel good – so that you keep doing them! And finally, when you’re ready to do so, tell them that you’re ready for your first client. Here are three ways to do just that. And to do so with a virtual bouquet in hand. 1 . Email your friends and family and let them know what you’re up to coaching biz wise and you’re taking on new clients. 2. 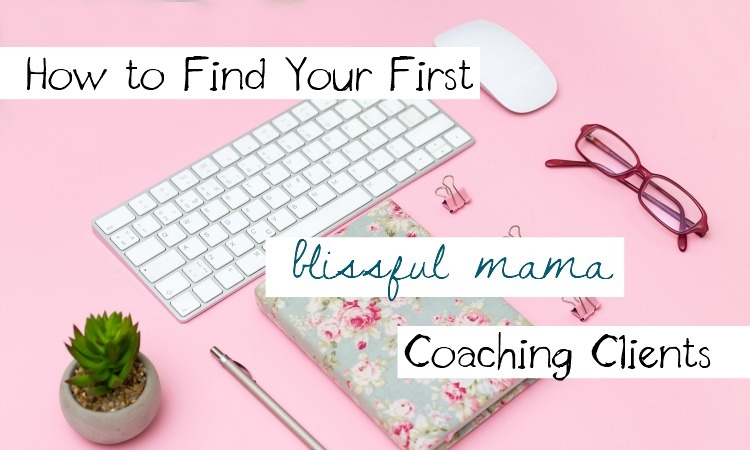 Write a blog post that goes into your big WHY around why you decided to go on the coaching route (besides the fact you want to work from home in this awesome way – that’s more little WHY stuff). 3. Approach your local chamber of commerce chapter, library, co-working space, women’s centre, local networking group and offer to do a talk related to on of the common struggles your ideal client is faced with. Have them sign up to get on your email list and then offer a free discovery call to experience working with you one on one. 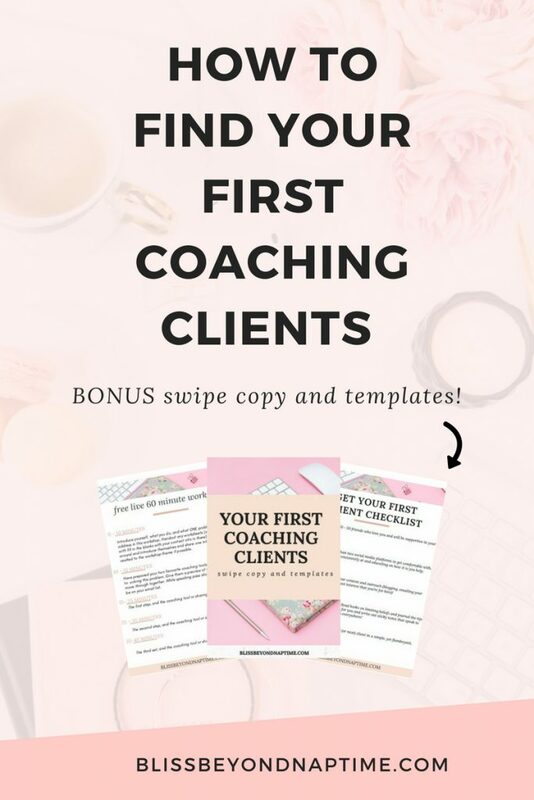 To help you out with these three primary ways to invite in your first coaching clients, I created a swipe copy and templates for you to play with. Add your name and email address below and you’ll get the script to riff off of for THE email, the bones of a THE blog post and an outline for THE free one hour workshop you’re going to bring to your local or online community. Have fun with this and keep me posted on your coaching client getting journey!